Cutaneous melanoma arises from transformed melanocytes and is caused mainly by environmental effects such as ultraviolet radiation and to a lesser extent by predisposing genetic variants. Only a few susceptibility genes for cutaneous melanoma have been identified so far in human; therefore, animal models represent a valuable alternative for genetic studies of this disease. In a previous quantitative trait locus (QTL) study, several susceptibility regions were identified in a swine biomedical model, the MeLiM (Melanoblastoma-bearing Libechov minipig) pigs. This article details the fine-mapping of a QTL located on SSC13 (Sus scrofa chromosome 13) through an increase in marker density. New microsatellites were used to confirm the results of the first analysis, and MITF (microphthalmia-associated transcription factor) was selected as a candidate gene for melanoma development. A single-marker association analysis was performed with single-nucleotide polymorphisms (SNPs) spread over the locus, but it did not reveal a significant association with diverse melanoma-related traits. In parallel, MITF alternative transcripts were characterized and their expression was investigated in different porcine tissues. 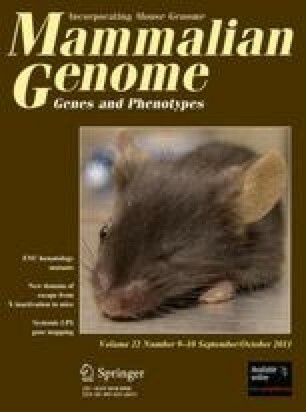 The obtained results showed a complex transcriptional regulation concordant with the one present in other mammals. Notably, the ratio between MITF+ and MITF− isoforms in melanoma samples followed the same pattern as in human tumors, which highlights the adequacy of the MeLiM pig as a model for human melanoma. In conclusion, although MITF does not seem to be the causal gene of the QTL initially observed, we do not exclude a prominent role of its transcription and function in the outbreak and evolution of the tumors observed in pigs. Nucleotide sequence data reported are available in the GenBank database under accession numbers GU097381, GU097382, and GU097383. The online version of this article (doi: 10.1007/s00335-011-9334-6) contains supplementary material, which is available to authorized users. This work was funded by La Ligue Nationale Contre le Cancer, in the framework of the projects of Genetic Epidemiology 2006–2008 and 2010–2011. ZQD was a postdoctoral fellow from INRA Animal Genetics Department and JE was a postdoctoral fellow from the INRA program “Jeunes Docteurs.” The authors are thankful to several people for microsatellite genotyping: Catherine Denis at UMR GABI, Micaëlla Germain at Labogena, and Julie Mautord at Plateforme Génomique in Toulouse. The authors also acknowledge Diana Zelenika for SNP genotyping organization and Patrice Dehais for providing SNP information.